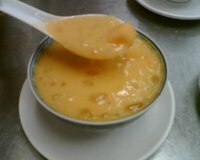 When I crave for traditional Chinese desserts, it usually takes a visit to Hong Kong to hit the spot. Its not until I chanced upon this traditional dessert shop in Chinatown a few years ago that I realised that I no longer have to travel the distance to satiate this craving. 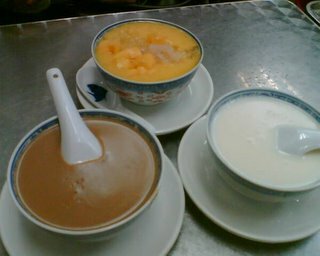 This is one of the very rare places in Singapore that serves traditional Cantonese desserts well - almond cream, walnut cream, peanut cream, sesame cream, tan dan (steamed egg), kwai ling kou (a bitter dessert made from some part of the turtle, and served with a syrup to counter the bitterness). My pick (its more of a personal preference, since they are all so fabulous) is the almond cream. You can almost taste the effort of the person who ground it by hand. Creamy yet light, tasty and not too sweet. My other favourite and a new addition to the menu is the mango pomelo dessert. Unlike the others which are served hot, this comes with ice chips, chunks of mango and pomelo bits, drowned in loads of rich mango sauce. This is simply delicious and lovely for those oh so hot days. It’s obvious that there are many others, other than myself who have caught onto the shop. At my last visit, I found that it has expanded into the shop next door. And go early, I dont recall the place being open past 6pm. Most desserts average S$3 (US$1.80).